With all the ranch dressing you dump on your salads, wings, pizza, and Cinnamon Toast Crunch cereal (apparently it kind of works! ), having a damn fountain of the stuff in your kitchen may actually sound more practical than insane. If that's the case, then 1) you may be in luck, thanks to a new product from Hidden Valley Ranch and 2) it might to time to rethink you life choices. Keyword: might. In celebration of National Ranch Dressing Day (yes, that's a thing) this Friday, March 10, Hidden Valley Ranch has launched its first-ever online store, featuring swag like ranch t-shirts, ranch tote bags, jewel encrusted bottles of ranch, and perhaps best of all, a real-life ranch fountain. 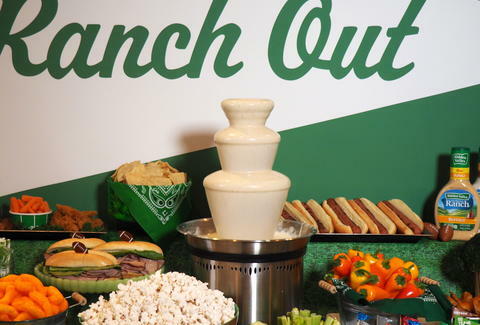 Humbly dubbed the Hidden Valley Ranch Fountain, it's basically a chocolate fondue fountain, but for ranch dressing. For $100, you get the fountain and a year supply of Hidden Valley Ranch Dressing, or 12 36oz bottles. Hidden Valley describes the appliance as "the ultimate dip dispensing party companion," but then again, nothing's stopping you from using it every day. In case a constant flow of ranch dressing on you kitchen counter isn't enough to prove your love for the savory salad dressing, the company is also selling limited-edition bottles of original Hidden Valley Ranch that come encrusted with jewels for $50 each. In other words, they're going to make a fortune. Tony Merevick is Cities News Editor at Thrillist and thinks one of these things would look great on his kitchen counter. Send news tips to news@thrillist.com and follow him on Twitter @tonymerevick.